Playa de Santa Marina Teens Surf Camp - Ribadesella, Asturias Guests overall rating: ☆☆☆☆☆ 0 based on 0 reviews. There is no better way for your grom to spend summer than being salty on Spain’s beautiful northern beaches. 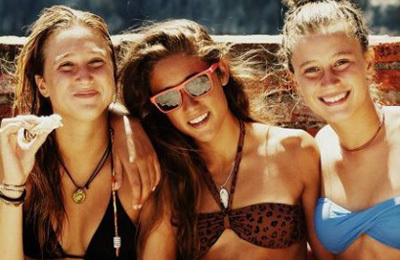 The Playa de Santa Marina Teens surf camp is where your kids can meet new friends and bond over the magic of surf. Our qualified instructors not only offer surf lessons – but education on tides, conditions, weather, surf forecasts, and any dangers. Our goal is to promote the healthy and happy lifestyle and the lifelong gift the beach can provide. The kids will enjoy a whole range of activities including surfing, stand up paddle boarding, longboarding, skating, soccer and beach volleyball. We guarantee your grom will make new friends and have the summer experience of a lifetime! Summer Surf Camp for teens from 10 to 17 years old, a perfect opportunity for beginners, intermediate and advanced surfers to have fun, learn and make new friends. Our friendly, experienced and professional staff will organize different activities, moments of relaxation and to regain strength on the schedule will make the most of an unforgettable time. Full board: breakfast, lunch, and dinner. The variety of breakfasts, lunches, and dinners in our restaurant of confidence, guarantees the replenishment of energy to make the most of our active days. We have the highest cover insurance and our material is top quality.All this makes possible that our surf camp in Spain is a reference and suitable for all kinds of visitors as children. You will have so much fun while you improve your skills. Theoretical classes on tides, conditions, weather, surf forecasts, and security. Practical classes at the on the beach before put all acknowledgment in practice in the water. Most of the classes will happen at Santa Marina Beach due it good conditions for surfing and safe environment. We also count on Eastern Austurias beaches with , waves and beautiful natural attraction typical from North Spain. The monitors have great experience in sports education, titled by the Spanish Surfing Federation and knowledgeable in rescue and first aid. SUP (Stand-Up Paddle): We will go around the coast and along the river to get a different point of view of beautiful North Spain, also great opportunities for unique selfies and pictures. Longboard/skate classes: specialized teachers, different sizes of boards, for beginners to experts, 3 different close by locations for all levels, right in front of our surf house, the slope of the lighthouse and the beach sidewalk of Santa Marina. The house has a privileged location, in front of the beach of Ribadesella, a tourist town but small, quiet and safe. Transfers are available under request. Airlines operating from Asturias are Iberia, Easyjet, Air Europa, and Vueling. Check Alsa website (www.alsa.es) for more info. Check FEVE railway company (www.feve.es) for more info. Ribadesella is located in the line between Oviedo-Santander.